The crowding and the scheduling of the family ski day seems to be especially attuned to mealtimes, which is of course especially French (even if not all that different from family ski days at resorts in other parts of the world). Ski lifts open at 9 here in the southern Alps, and the télésiège (chairlift) and télécabine (gondola) lines are heavy by 10:30, after the leisurely petit déjeuners (breakfasts) with chocolat chauds (hot chocolates) and croissants have been eaten. The activity on the slopes quiets down considerably during the sacrosanct midday mealtime (except at the mountain and village restaurants! ), and then again, after 5 pm, when one begins to see bunches of baguettes under the arms of ski parkas in the village. By this time, the last chairlifts stop running and families prepare for goûters and apéros (snacks and cocktails), before the evening meal around 7 or 8 pm. Interestingly, we've met several adults without kids, French and foreigners alike, who are or were vacationing here at this same time as all of these French families with schoolchildren. If I were an avid skier and a parent without children at home (I am neither), I think I would avoid this particularly crowded time. One would think the accommodations would be cheaper and more widely available, and the village less boisterous (there's a carousel and marching band in ours, and a Wednesday evening super-spectacle complete with torch-bearing skiers and a fireworks display! 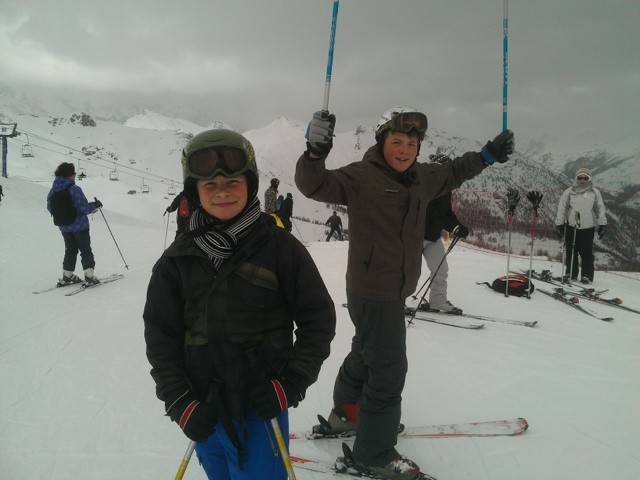 ), while the lines would be virtually non-existent and the snow would be as good and powdery even a few weeks on either side of the school holidays. We were in the Haute Savoie last Easter, outside of the school holiday times and had good snow, very short chairlift lines, and lots of fin de saison (end of ski season) sales on ski gear. (I mentioned this trip in a post in April 2012 called Département 13.). I'm sure the local hotel and restaurant proprietors appreciate the extended and less frenetic holiday times, but for many guests, I suppose part of the charm of alpine skiing is the lively aprés-ski scene. Without the hustle and bustle of vacationing families in the villages, the excitement and energy of the social environment after skiing is likely much lower, weaker, or might we say, softer, just like snowballs made of snow too early or too late in the season.